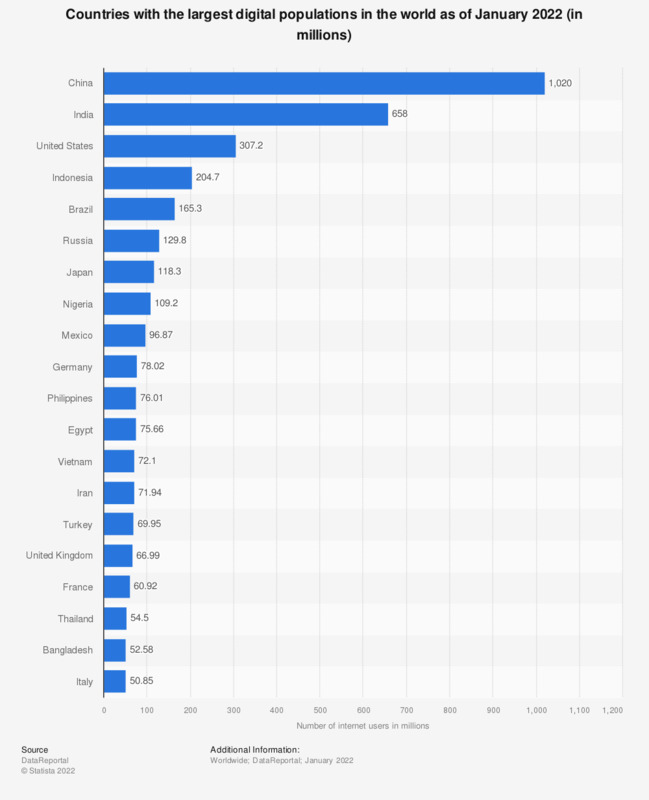 The statistic shows the number of worldwide internet users in selected countries as of December 2017. China was ranked first with 772 million internet users, more than double the amount of third-ranked United States with just over 312 million internet users. Overall, all BRIC markets had more than 100 million internet users, accounting for four of the seven countries with more than 100 million internet users. According to a recent report, there were 3.49 billion internet users around the world. Considering that the number of humans living on Earth is presently estimated at some 8.5 billion, this means that over 41 percent of the world population is interconnected through the use of internet. There are, however, stark differences in user distribution according to region, where East Asia is home to 923 million internet users, while African and the Middle Eastern regions have lower user figures. As of 2017, China ranks first in a top of countries with most internet users. Due to its ongoing and fast-paced economic development, but also to a cultural inclination towards technology, more than 731 million of the estimated 1.38 billion population in China are online. Some of the other notable emerging markets are India, with a projected number of internet users of 636 million by 2021, or Indonesia, which is expected to have 144.2 million of its citizens surfing the World Wide Web around the same year. Notwithstanding the leadership of China and the overall Asia Pacific region in terms of sheer number of cybercitizens, the most common language in the online medium is still English, which is preferred by over 26 percent of the total number of internet users.